I have over 30 years experience in the art of piano maintenance and rebuilding. 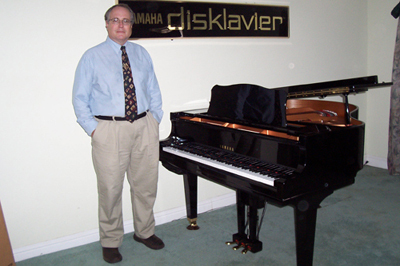 I started as a nineteen year old apprentice with a Steinway dealership in Dallas, Texas in 1974. My experience as a piano tuner-technician includes concert grand preparation, ie. action regulation, string prep, tuning-voicing and total rebuilding. I also have experience with vertical pianos as well. I have done work with many institutions. Different scenerios from jazz to classical situations has been my main focus. I worked for the Baldwin Piano Factory retail store in Atlanta, Georgia for thirteen years in all retail, concert, and recording situations. I have since studied with Yamaha's Little Red School House and I am certified to service Yamaha Pianos and Yamaha Disklavier pianos. I maintain pianos in homes, schools, churches - wherever there is a piano. I own a 1200 sq. ft. piano rebuilding facility.